I came home from work one day in late October and my fiancé told me there was a cat in our ditch. Being an animal person I immediately went out to get some cat food and came back to find a skinny little Siamese cat, scared and hungry. I gave him food and water every day for two weeks outside before realizing the cat was not going home and no one seemed to be searching for it. I took him in and posted his picture, looking for an owner. No one claimed the poor little thing so I took him. After a trip to the vet I learned he was four months old, had been neutered and must have had all his needles. (To be safe, he got a few more). I was never a cat person, and had never dreamed of owning such a beautiful one. But he stole my heart and I could never let him go. I named him Sapphire (Sappy for short) and he is the biggest mama's boy! He never leaves my side! Shortly after I took him in I started working at a local health pet food store. Needless to say he is one very spoiled kitty! He's a little over a year now and doing very well. Through my research of Siamese, I'm almost sure he is a Lilac Point, he was very pale as a baby but has been getting a bit darker. Enjoy his picture, he is definitely one handsome boy! Hi Paige and welcome! Sapphire's a beautiful Applehead Siamese and I think you're right, he is most probably a Lilac Point. I love reading stories like this and am so glad he's found a welcoming and loving new home with you. He's actually not the first rescue we've had called Sapphire - check out little Safira, a Siamese kitten from Portugal (who must be all grown up by now). Thanks for stopping by and sharing your story and your picture of your Canadian 'Sapphire'. My sealpoint also likes to walk on my keyboard while I am on the computer. She loves attention!! Thank you everyone so much for all your wonderful comments. :) I wish I had more pictures from when we first took him in, The picture you see there is from just this July 2011. Hiya!! I am the lady who is owned by Safira [Saffy!] in Portugal!! Your Sappy looks lovely!! I am glad he found you and made you into a good cat owner lol! They have a way of doing that! Saffy too is now about a year old [we found her on 3rd Sept last year] and is now so beautiful too! Beautiful! As I'm sure you will agree, Siamese are very social, and entertaining cats. I wish you many years of companionship and enjoyment with your handsome Sapphire. Oh he is beautiful!!! 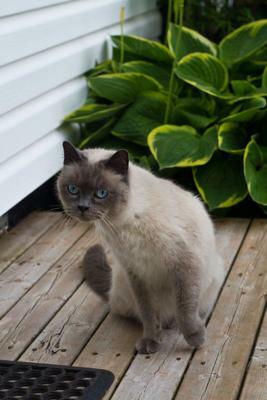 I also rescued my Siamese cat, never had cats, but i just fell in love with him. Good luck and enjoy the life with your precious Siamese cat.